We’ve all heard it a thousand times – we’ve got to work smarter, not harder. Easier said than done when we have a million things on our to-do list. So it’s a good thing we live in the technological age where there is an app for just about anything, right? Every time a new problem arises, we find a fast and efficient solution by introducing a new tool, and moving on. We keep adding tools, fitting them in, each to do one little thing instead of ten big things. Sure, we can all do more research to find the right tool that integrates with everything. But who has the time? We are growing a business! But then, the bigger the business gets, the more tools we have to juggle, and pretty soon, the whole thing is a plate of spaghetti. Painful. For example, I’ve worked with incredible coaches who needed to reference three different places to prepare for a coaching call with their clients – a questionnaire that lists clients’ goals, an email with the clients’ latest homework, and a notebook where they log clients’ progress. Maddening! I’ve also worked with multiple 6-figure businesses that didn’t know the exact number of active members in their paid community because the numbers shown by their membership site, payment processor, and email marketing provider didn’t match. Gut-wrenching! As a result, we’re stuck reconciling our data by doing draining, stressful, and often, costly, busywork – whether that means taking time to reference every place where we store information before every client call, having an assistant copy-paste information from a number of different places into one document, or paying yet another person to manually cross-reference the lists of our membership community members to get an accurate number. Naturally, like any growing business, we want to continue adding more clients. Which means that the mindless busywork mounts up. Eventually, we (including our team) find ourselves drowning in it. Sales are exceeding what we could ever imagine a year ago. Yet, reaching this capacity doesn’t feel like an achievement, because we know it’s unsustainable. Instead of celebrating our wins, we’re calming that sinking feeling in the pit of our stomachs because we know that if we push ourselves to do more than our present capacity can handle, it just might break us. We’ve hit a ceiling that forces us to wonder if we have to resign ourselves to the fact that this is as big as our business might ever get. And, that’s after all the work we’ve put into growing our business till now. Devastating! 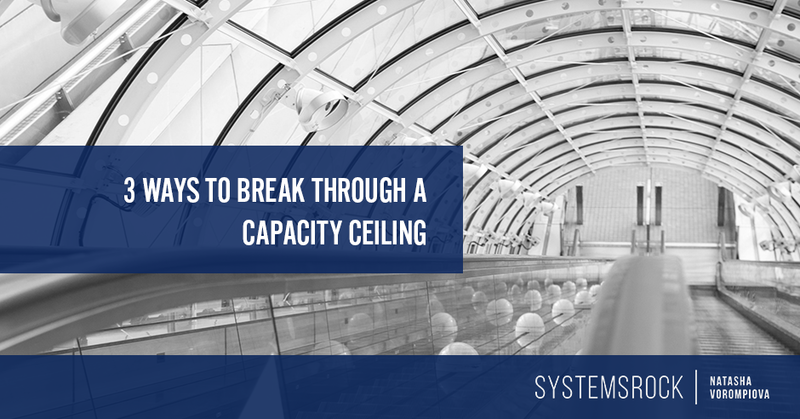 So, is there a way to break through this capacity ceiling? Is there a way to breathe oxygen back into our business and make us feel comfortable and safe to continue to grow? A lot of times we are too close to our business to see all available options of how a problem could be solved. We are so used to doing things the way we’ve always done them that it’s unimaginable that there could be a better, more efficient way. That’s what happened when Andrew Warner, an award-winning podcaster and founder of Mixergy, reached out to us to organize his process-related documents. Andrew is very system-oriented and demands that everyone on his team documents their processes. For a business like Andrew’s that means A LOT of process documents, i.e., standard operating procedures or SOPs. At the time that we spoke, there were over a hundred of SOP documents in his Google Drive scattered across a dozen different folders. Andrew reached out for help because his team members were struggling to find the needed SOP quickly. They had to review a number of folders to find what they were looking for, and often had to sift through outdated documents. This resulted in team members either spending their own time searching for the right documents or interrupting their colleagues, asking for help. Even if each team member was spending only 30 minutes a day searching for the documents they needed or helping a team member find something (a pretty modest estimation), the team’s inability to locate needed SOPs when needed was costing the business over $3000/month. So, Andrew asked us to organize his Google Drive. A logical solution. Upon examining the situation, we realized that organizing the Google Drive wouldn’t solve the problem. Given the volume of documents Andrew had, he would have needed a complex structure with multiple levels of folders and subfolders which was possible to build, but would have been a nightmare to maintain. Andrew’s Chief of Operations, Marisela Khalili, would have had to be constantly monitoring all the folders making sure that new documents created by team members were in correct folders. Not the best use of her time! Also, organizing Google Drive would not solve the problem of people quickly finding the documents, because they would need to master a multi-level structure of folders and subfolders. As logical as we’d try to make it, the folder structure might still not be very intuitive for a regular team member. That’s why we recommended that they kept process-related documents in Google Drive, but implement a document library that makes all documents easy to find. The choice of the tool for the document library was based on the results of the careful analysis of Andrew’s unique situation and applications he was already using. I know a “document library” sounds simple, but often times the simplest solution is the best. Now, Andrew’s team has a beautifully organized catalogue of SOPs that’s easy to scan and locate the needed document in a few minutes. Not only will this simple and intuitive implementation save Andrew an estimate of $3000 mentioned earlier, but it will also open the doors to utilizing the team more effectively rather than hiring new staff. As you can imagine, this will greatly reduce everyone’s stress and create a stronger company culture. So, sometimes, the solution that initially seems to be most logical turns out to mean just continuing to work harder, instead of changing tracks and working smarter. We’ve all been in that situation where we’ve talked with a friend, a family member, or a colleague about an insurmountable problem and they gave us a simple solution that wasn’t even on our radar. So, don’t be afraid to talk to somebody. And in this situation, probably someone with a little bit more technical expertise will help you to get a fresh perspective and find a more effective solution to your problem. Reflection Time: Where could things be simplified in your business? For businesses that grow fast, it is very common to build processes and put together systems on the fly. (In my experience, it’s the rule rather than an exception. So, if that’s what you’ve done, don’t be too harsh on yourself). Would this be a sustainable solution if we doubled or tripled our customer base? Would this tool simplify or complicate things if we were to double/triple the number of people using it? Given the tools we are already using, would this new tool add to the workload of our team or reduce it? Of course, this is common in the world of just-in-time business management. If your goal is to continue scaling your operations, it’s important to evaluate the impact of adding every new tool or procedure on the rest of the processes. Unfortunately, there is usually little physical or mental space to make such evaluations. Plus, who has the time to understand all that technology? If you are not careful, though, pretty soon, things might become unbearable. That’s how the Author Accelerator team felt when they reached out to us. When we started working with the team, they had 30 book coaches who were guiding a few more than 150 writers through their Author Accelerator coaching programs. Because of their incredible results, the demand for the Author Accelerator programs was constantly growing. Everyone’s dream, right? The team needed to manually check everyone’s profile and eliminate possibilities one-by-one when the criteria did not match. Then, they would become the middleman between coaches and writers to work out more delicate details, like personal preferences and availability. How draining is that! On top of that, the Author Accelerator team also spent time juggling information across five different platforms. They kept two different Google sheets and re-entered the same information in four different places. What a hassle! To remedy the situation and create a new setup that would accommodate rapid growth, we brought Author Accelerator’s information into a single platform that allowed the team to easily reference and match data about coaches and writers. Streamlining and supercharging their processes also allowed Author Accelerator to work with more clients without adding significantly to the workload of the team. This implementation allowed them to increase their capacity to take on $X worth of clients that they wouldn’t have been able to take on using the old setup. To further put things in perspective, when we first started working with this team they they were hitting their capacity ceiling making $300K a year. A few short months after we helped them to open their growth corridor, they were already at $500K. And now they are on the way to a $1mln a year with no capacity ceiling in sight. Now, that’s working smarter, not harder! When you hit a capacity ceiling, it is very easy to think that you are stuck in that hole. Instead of powering through your challenges, take a step back and look at the business as a whole. It will give you and your team an opportunity and the space to objectively work out what your next step should be. Reflection Time: How could you benefit from supercharging your processes? Content – past, present, and future in various formats. It’s mind-boggling, if you think about it! Most business owners, though, don’t realize that their data, or in effect, lack of it, is actually costing them hundreds, thousands, if not millions of dollars a year, because they make decisions based on incomplete information. Making sense of that data is challenging enough because of the sheer amount of it. But what makes taking full advantage of all that data exponentially harder is that it doesn’t usually live in the same place. That was the problem Jessica Abel was experiencing after taking several cohorts of students through her Creative Focus Workshop. Before every new round of the program, she would tweak the materials and the process to deliver even more powerful transformations to her students. What was really bothering Jessica, though, was that because the coaching her students was a big part (and the success) of the process, she could not scale the program past a certain number of students. When we examined the problem, it became apparent that adding more coaches (another logical solution) would not solve the problem at this stage. In fact, it would probably result in lots of inefficiencies and communication issues that Jessica would be pulled in to resolve. The problem was not disorganization. All Creative Focus Workshop intake forms, weekly review forms, feedback forms, lists of past students, and all important metrics were neatly organized and color coded in dedicated folders. Great data, meaningful data, but, at the end of the day, not actionable data! The ultimate challenge was that information was scattered across so many spreadsheets that it was really difficult to see the overall picture – what were the student’s goals, what was their crisis point, what was really going on. To coach effectively Jessica needed to integrate all she knew about the person, which would allow her to really be present for them and guide them through their specific challenges. So, what we created for Jessica was a single repository of all student-related information that allows her to zoom in on a specific person or zoom out on the entire group. We streamlined the process of collecting data and set up automations so that when one action is performed, it triggers consequential actions that used to be done manually. We even automated tracking of certain student performance metrics. A “work smarter” setup that Jessica’s future coaches would greatly benefit from as well. According to Jessica’s estimations, this implementation will save her an average of 10 hours per cohort, allowing her to teach more cohorts throughout the year and make higher quality impact with her students. Greater accessibility of data will also make Jessica comfortable to offer higher-priced coaching packages. So while even the most efficient and most organized business owners like Jessica can neatly arrange information, sometimes, once again, taking a step back and looking at things through a different technology lens can have substantial impact on your effectiveness and your ability to create new revenue streams in your business. Reflection Time: What would you love to automate? The problem is, when our systems are broken, adding more people to work with them – be that a fantasized clone or actual, real-life super-qualified team – can make things even worse. On the other hand, when we make it a priority to simplify, supercharge, and automate our processes, for our capacity, the sky’s the limit.